Climate science can seem dense, remote, and abstract. But through the lens of this one tree, it becomes immediate and intimate. 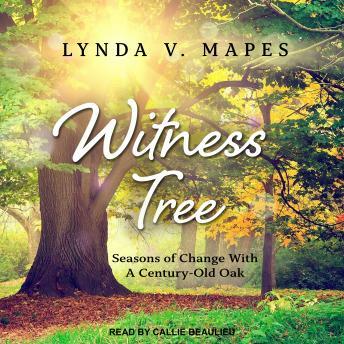 In Witness Tree, environmental reporter Lynda V. Mapes takes us through her year living with one red oak at the Harvard Forest. We learn about carbon cycles and leaf physiology, but also experience the seasons as people have for centuries, watching for each new bud, and listening for each new bird and frog call in spring. Lynda takes us along as she climbs high into the oak's swaying boughs, and scientists core deep into the oak's heartwood, dig into its roots and probe the teeming life of the soil. She brings us eye-level with garter snakes and newts, and alongside the squirrels and jays devouring the oak's acorns. Season by season she reveals the secrets of trees, how they work, and sustain a vast community of lives, including our own. The oak is a living timeline and witness to climate change. While stark in its implications, Witness Tree is a beautiful and lyrical book, rich in detail, sweeps of weather, history, people, and animals. It is a story rooted in hope, beauty, wonder, and the possibility of renewal in people's connection to nature.